Sam I Am — City Lights Brewing Co. Thanks to all who came out and celebrated Black Friday with us. The New England IPA sold out Friday and our Nitro Coconut Porter was met with rave reviews! Hurry down as there are still a few pints left of this incredibly smooth masterpiece. If you have been to City Lights, you may have had a chance to cross paths with our tour guide extraordinaire, Sam Young. Sam is one of the most genuine and nicest persons I have ever met. Sam will be traveling on a mission to Greece in January on behalf of “For the Nations Refugee Outreach.” On Tuesday, December 5th, City Lights will donate 50% of its beer sales proceeds to "For the Nations" on behalf of Sam. Come and join us, share some great beer, great camaraderie and help support those supporting the immigrants from the warzones in North Africa and the Middle East. Our Friday fish fries are delicious! Ben the Chef and his crew are serving up delectable dishes that pair extremely well with our beers. And if you haven’t tried our brunches, why not treat yourself this weekend? The Marquette Golden Eagles take on the Georgia Bulldogs Saturday at 1PM. A pre-game brunch and a complimentary shuttle to and from the Bradley Center is a great way to weekend. We are busy planning some exciting new offerings for our retail partners for 2018. We’ve finalized our brewing calendar and the release dates of our specialty beers in limited release 16-ounce cans. 2018 will be exciting indeed! Double IPA kicks off the excitement. And speaking of kick-offs, please join us Saturday evening as the Wisconsin Badgers continue their journey towards a National Championship when they play Ohio State, Kick-off is 7PM. 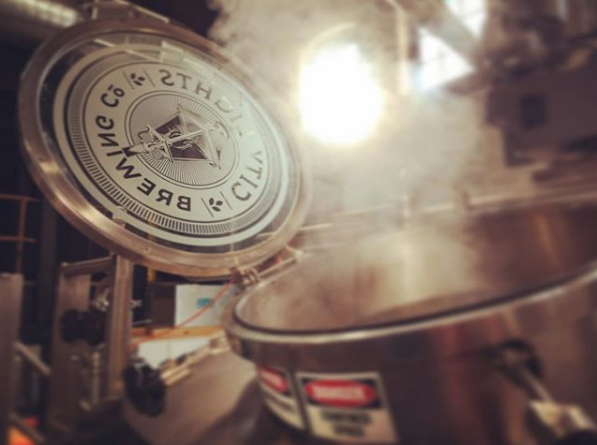 Jimmy the Brewmaster and the brewing team are stoked with the upcoming releases of both the Coffee Stout and his signature Wisconsin-centric beer. The holidays at City Lights will rock!